Yesterday we pushed back the clocks, resulting in a sunset at 4:45pm. Doesn't it feel like it was just June? When I could take outfit photos at 8pm, and when a cold, bitter wind wasn't howling at my windows, making the decision for me to not venture out and take photos at all. The winter months are always a challenge for me. They make me want to move south, they make me want to stop featuring outfit photos on the blog, they make me furious that heels and cropped pants and heels and bare legs are viewed by the fashion community as acceptable 'winter attire'. But amazingly, every year for the last six years, I've blogged through it. I've even managed to put together some pretty okay, frostbite preventing looks. I have to believe that this year will be no different, that there is plenty to look forward to which will get me through the cold and back into the warm embrace of Memorial Day. Loving the color combination in this outfit! Hear ya on the less daylight at night struggle... hate that. In more exciting news, ADORE this outfit! The leather and plaid look so good together. i agree that this early sunset time makes picture taking so much harder!! i do love all your mix of prints, layers and textures in this look. beautiful outfit and we'll make it through! Great combo dear, love your jacket, pretty. I am lucky in that my middle school age son takes my pictures when he gets home from school ~ 3 pm. This way, the light is good and less neighbors leering. I'm sure he won't want to venture out when its blowing snow. That will be when I'm wishing to be back in Florida. 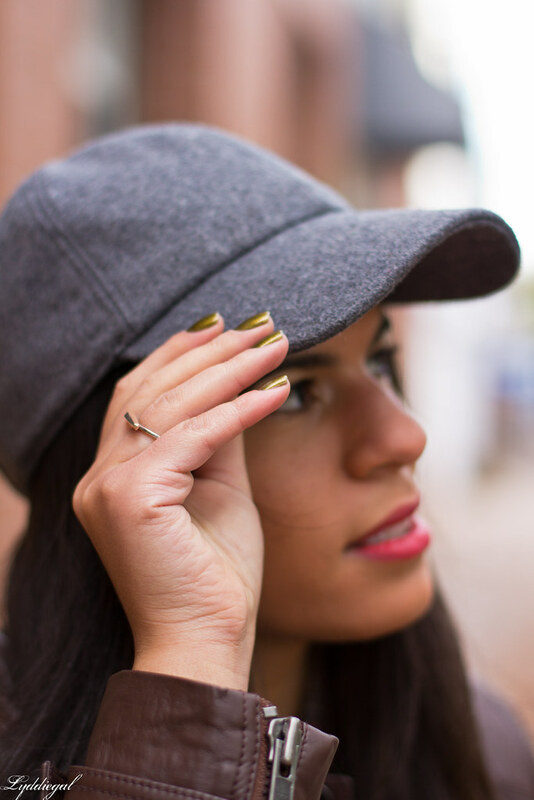 Your look today is perfect for these chilly fall temps. I love the polish and jacket. I just ordered butterscotch colored one and can't wait to wear it before it gets too too cold. My only complaint about winter is that it seriously impedes my photo abilities. It's dark at like 4:30 pm here! But, aside from that, I can honestly say that I'm really looking forward to it....I'm a very twisted individual! I so understand you. Last winter Ireland had the worst- storms after storms and rain nearly every day, it was such a challenge for taking photos and now it feels like we are going back to the same weather. Just Sunday the sky cleared and let a bit of light and pushed rain away. Otherwise it felt like never ending rainy evening, so dark it was, through out the week. You already have styled gorgeous casual chic look. Wonderful color pairing. 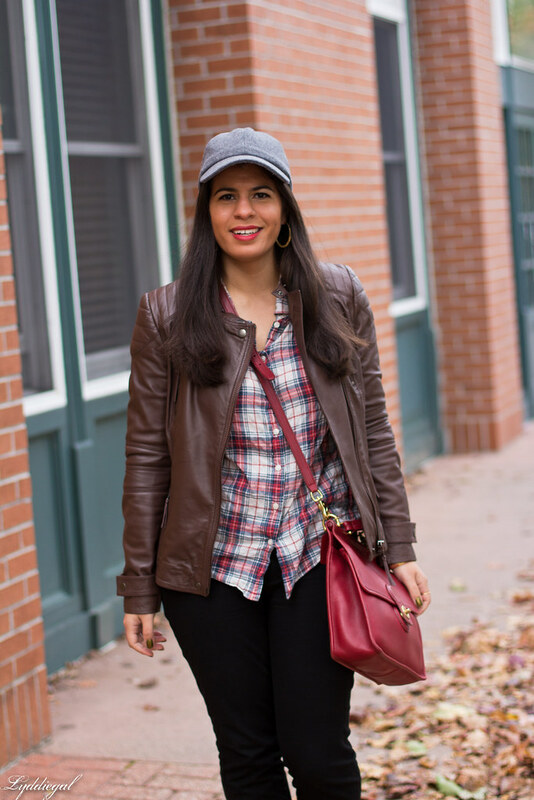 Love this Fall appropriate look! We got an extra hour of sleep but yet I'm exhausted, Monday blues! I totally feel you on the early sunsets now! Love that jacket and plaid top-- you're always so put together! I agree. 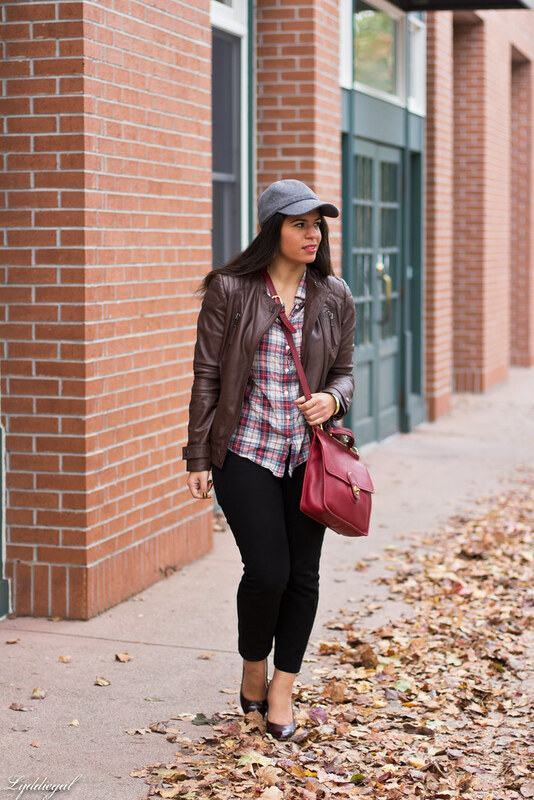 Once the temps drop, I'm so "blah" when it comes to snapping OOTD's for the blog. I'm usually freezing in most posts, lol. Love your look here. Very cute and the nails and jacket are my fave! Yep, yep, yep. I can totally relate (even though this will only be my fourth winter). But you inspire me to keep going! You do great with winter outfits and, hey, at least you have a photographer now right? Love the hat and plaid! I love this look, and the color combination is perfect!!! Yes, I have a similar hatred of the earlier sunsets, grr. 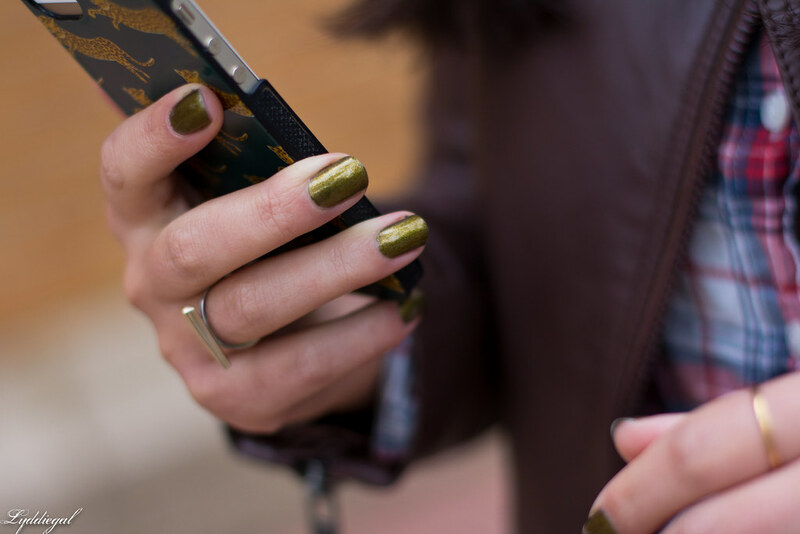 You've always blogged through it fabulously (this look is no different). I can't seem to get in more than 2-3 looks a week even before the time change, so I'm screwed! Note to self, plan better. Love the shirt and jacket! I am not looking forward to winter either. I don't like it getting dark so soon! What a great sporty chic outfit. Love the plaid shirt and the hat especially! I have the worst time blogging in the winter! And its a struggle to have anyone willing to take the photos in the freezing cold! I am going to try to make a strategy and plan ahead more this year--but we will see ha! I love this look on you--the phone case is adorbs too! Totally loving your jacket and bag! And I'm the same way....every year, I wonder how I make it through the winter taking blog photos...it is not fun! Cold blogging isn't fun. I really like that jacket on you. Aww I really love this cool weather look. I'm going to try plaid with my leather jacket soon! If there was snow on the ground I'm not sure I would have removed my sweats for the day. Those shoes are gorgeous! And I'm loving the plaid. And yes I'm pretty sure it was June like last week. it is so sad when it gets dark so early :( cute outfit and I love your nail color! 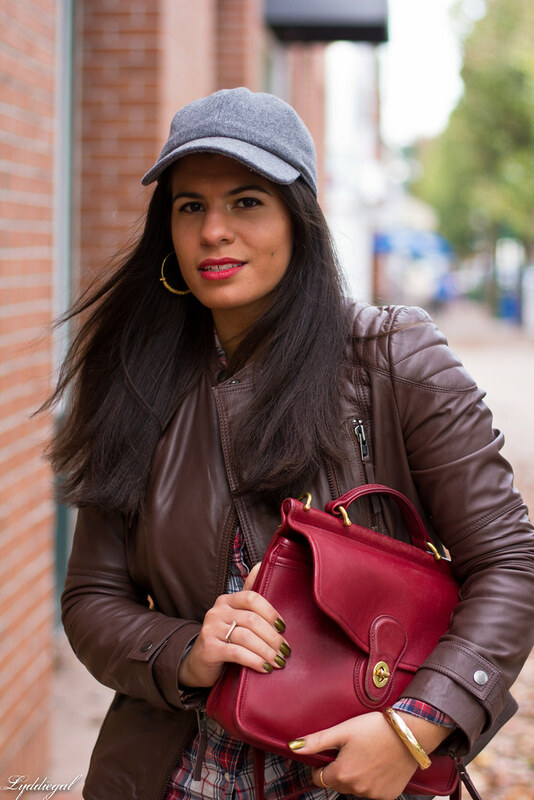 I love that hat on you, and your bag is gorgeous!! It's so hard to find the motivation with this chilly weather! It also makes me feel guilty that I only have a couple of winter coats that I actually wear. I probably need another so I don't bore everyone too much in the coming months! I love that purse. It's so perfect for fall! I was just thinking that about outfit pictures. I always have to have a weekend photo session in the winter to get them outside when it's light out. 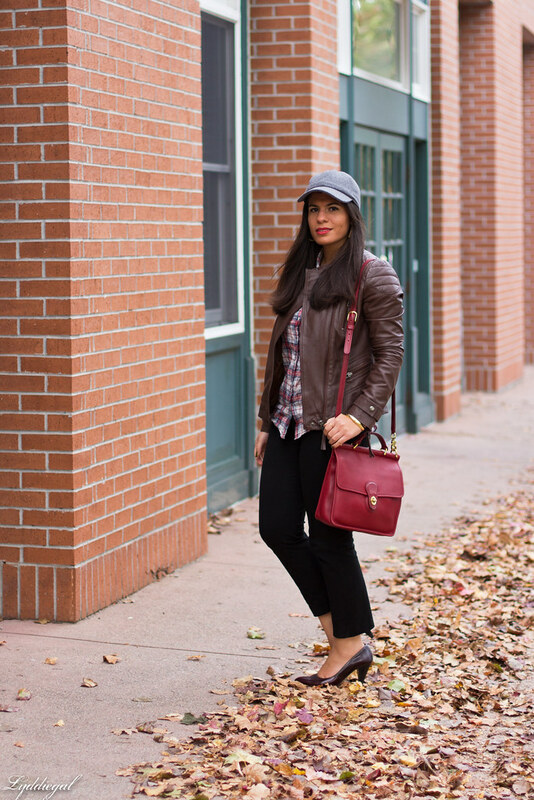 Love the neutral tones with pops of red in your outfit today! I despise when the time changes. I HATE leaving work and it is dark. Plus it makes outfit pictures even more challenging. 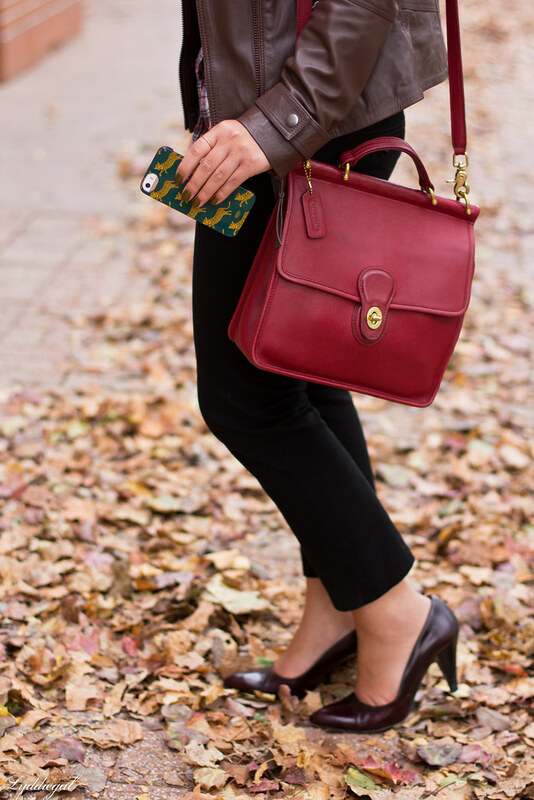 But this is such a great fall look! Love that jacket! I love these colors together, you look adorable. I admire how fashion bloggers work with the changing weather. I just left Ohio and it was about to turn cold with snow flurries. HaHaHa I just made it back to New Orleans. It's like Summer here. Love your top and bag Lydia. The cold weather always makes me feel like wanting to move as well! It is so tough with limited daylight hours now! Loving this outfit. Love the top and that bag is so gorgeous! Looking great. Fashion blogging through the winter months I am sure is a big challenge. I am wimp when it comes to the cold, I freeze when it's in the low 60s. You always have great outfits and I look forward to seeing how you bundle up and looking stylish at the same time. Love this outfit Lydia! I'm definitely missing the extra daylight already too. We can't really avoid Winter weather in the Northeast, but once the holidays are over the days will start gradually getting longer again. You can do it Lydia and I'm sure the fall looks will be fab! Yep, this is the season when it's so hard to take outfit photos! It was so dark before 5 yesterday :/ Ah well, we just push through! I love the color of your leather jacket. You're busting out the layers, which must mean it's getting cooler! Love how the you styled the plaid shirt here! What shade of lipstick is that you're wearing. I can relate! I had such a hard time trying to look presentable in warm clothes… its such a challenge for me!